Fujifilm India Private Limited, a pioneer in imaging technologies, today announced the launch of its rangefinder-style GFX 50R medium format mirrorless camera which features the FUJIFILM G Format (medium format, 43.8x32.9mm) image sensor, which is approx. 1.7 times the size of a full frame 35mm image sensor which is in use commonly. The GFX 50R continues the compact, lightweight and superior image quality characteristics of Fujifilm’s GFX medium format mirrorless digital camera system, while weighing approx. 145g less and 25mm thinner than the FUJIFILM GFX 50S (GFX 50S). The GFX 50S had attracted high praise from professional photographers since its launch in January 2017. Yet, many field photographers who specialize in weddings, portraits and street photography have sought after an even more compact and lightweight camera, along the line of Fujifilm’s traditional medium format film cameras. With this in mind, FUJIFILM added the new “GFX 50R” to the lineup which is also the world’s smallest and most affordable medium format mirrorless camera. GFX 50R is also the first camera in the GFX system to feature Bluetooth compatibility. In India, the camera is available at a price of Rs 369,999 (Body Only). Along with this, Fujifilm also added two new XF lenses namely XF 8-16mm f/2.8 R LM WR Lens and XF 200mm f/2 OIS WR Lens to the lens lineup for its X Series range of Mirrorless cameras. The XF 8-16mm f/2.8 R LM WR is a 12-24mm-equivalent lens featuring a constant f/2.8 maximum aperture for consistent performance throughout the zoom range. The XF 8-16mm f/2.8 R LM WR is available at Rs 159,999/-. The XF 200mm f/2 OIS WR Lens, on the other hand, is the first super-fast telephoto lens in the XF lens lineup, offering a fast maximum f-stop of 2.0 and a focal length equivalent to 305mm in 35mm film format. Taking advantage of technologies synonymous with FUJINON lenses, this new telephoto lens boasts exceptional image clarity with the ability to produce beautiful bokeh, making it the perfect choice for shooting sports and wildlife. It is available at a price of Rs 479,999/-. With these new additions, Fujifilm India hopes to consolidate its position in the Mirrorless Segment and plans to achieve 30% Share in the Indian Mirrorless Market in the next 3-4 Years. ・The GFX 50R is approx. 145g lighter than the GFX 50S (weighing 920g with EVF). The camera body is just 66.4mm thick, 25.0mm thinner than the GFX 50S. ・The rangefinder style design allows you to keep your eye on a subject while looking through the viewfinder with the other eye. This enables checking and feeling the atmosphere of the scene around your subject matter, shown in the EVF. ・The GFX 50R is equipped with the 0.77x 3.69M-dot organic EL electronic viewfinder (EVF). This allows accurate focusing despite the large size of the medium format sensor, which has a shallower depth of field than that of a 35mm full frame sensor when shooting at the same angle of view. ・The medium format (43.8mm x 32.9mm) “G Format” sensor has better per pixel light reception capability than that of a 35mm full frame sensor of the same resolution. Furthermore, the micro lenses have been designed to optimize the light gathering performance and image resolution as well as the handling of data from photodiodes are customized to achieve a superior level of image quality, surpassing that of existing cameras that use a sensor of the same size. As a result, the GFX 50R delivers images that precisely reproduce the subject’s texture, three-dimensional feel and even the atmosphere of each scene. ・The GFX 50R is equipped with the Focus Lever to allow quick adjustment of the focus point. The elimination of the selector buttons provides extra space to hold the camera better. The top panel sports two dials, one for shutter speed and the other for exposure compensation. The milled aluminum dials give the camera a premium feel and satisfying clicking touch. ・The robust magnesium alloy body is weather-sealed in 64 places to provide dust and weather resistance and ability to operate at temperatures as low as -10℃. Its durability caters to the needs of all photographers. 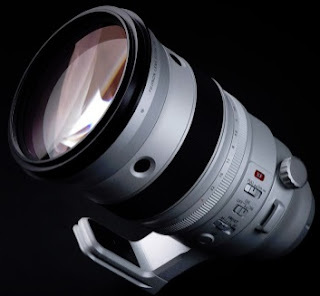 ・The medium format mirrorless system, GFX system, currently offers a lineup of seven FUJINON GF lenses, covering focal lengths from 23mm (equivalent to 18mm in the 35mm film format) to 250mm (equivalent to 198mm in the 35mm film format). All GF lenses are able to resolve up 100MP which means they are future proof. They are also dust and weather resistant and designed to operate at temperatures as low as -10℃ so that they withstand professional use in harsh conditions. ・Tethered shooting is essential part in a professional photographers workflow. The GFX system supports tethering software “HS-V5 for Windows” and “Tether Shooting Plug-in PRO for Adobe® Photoshop®”, “Capture One Pro (FUJIFILM)” is also due to be released, giving extra options in studio sessions for commercial and fashion photography. This means that a professional photographer can incorporate the GFX system into their regular workflow. ・This is the first model in the GFX system to support the Bluetooth® low energy technology. Captured images can be transferred easily and quickly to smartphones and tablet devices paired with the camera via the FUJIFILM Camera Remote app.